Are you searching for a HP Laserjet P2055n laser printer to streamline your business’ workload and promote efficiency? Well, look no further because Arizona Copiers has the greatest inventory full of the finest Hewlett Packard models in the whole state. With our amazing discounted deals, we will be able to help your business obtain this high-quality printer to satisfy all of your printing needs while still staying within your budget. When you join our professional network, you will benefit from outstanding customer service, fast and easy delivery, and access to the top repair services in the industry. We are never happy unless our loyal customers are completely satisfied with the purchasing experience. If you have any questions or wish to receive a quote, please contact us at 602-428-5885 today! Do not be fooled by the compact size of this laser printer, this HP Laserjet P2055n is reliable, durable, and ideal for businesses with a busy workload. This Hewlett Packard model works as hard as you do, producing an incredible 50,000 pages per month. The printer features awe-inspiring print speeds up to 35 pages per minute in black and white for efficient production of all your business documents. The built-in duplexer enables fast two-sided printing to avoid the hassle of flipping pages, save time, and reduce paper consumption costs. Your business will also not have to refill paper as often, since it comes with a standard 300-sheet input tray. The straight-through paper path of the HP Laserjet P2055n ensures that even heavy paper media will process quickly without jamming or crunching. You can process text and images on a multitude of media, such as envelopes, cardstock, labels, transparencies, color paper, and more. The Hewlett Packard model boasts a high-performance 600 MHz processor with a 128 MB memory to handle all of your complex printing jobs. The high-quality 1200×1200 dpi resolution will also provide crisp, sharp, and appealing output every single time. Arizona Copier offers the HP Laserjet P2055n with tons of innovative technological features that create added convenience and capability. The Instant-on technology enables output of the first print page within eight seconds to maximize your work day. Furthermore, the embedded HP Jetdirect Gigabit Ethernet print server incorporates the ability to increase network band-width for sharing complex documents. The broadband speed allows the entire workforce to print to a single printer easily. Compatible with both PC and Mac operating systems, the printer is easy to navigate for all members of the team. 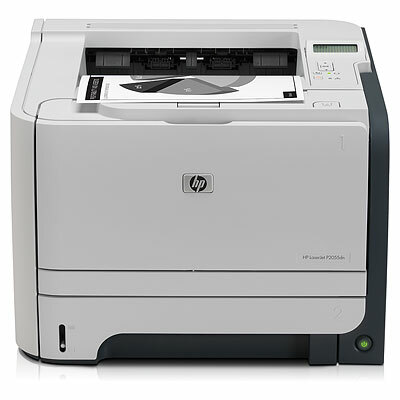 Get Your Own HP Laserjet P2055n Today! Whether you are looking to buy, rent, or lease a printer, we have a variety of options to satisfy all of your preferences. When you choose a HP Laserjet P2055n from the Arizona Copier company, you will realize the best that Hewlett Packard has to offer and experience increased productivity for your growing business. Plus, we offer unmatched warranties that are guaranteed to protect the value of your newest investment. Please do not hesitate to call us today at 602-428-5885 to get your hands on this tremendous printer!